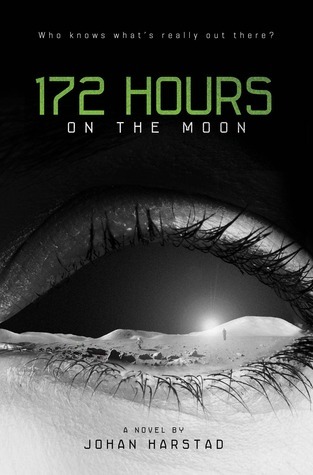 172 Hours on the Moon by Johan Harstad. Little, Brown, 2012. Hardback/Hardcover. 355 pages. Quick note: I actually read this book a year or so ago, but realized I never got around to posting a finalized version of my review, so I decided to go back, fix it up, and finally post it. Space horror is one of the greatest genres. Nothing is creepier or more interesting than thinking about the vast unknown universe and imagining everything that could exist or be occurring out there. If the cover of this book - that dark, empty eye - doesn't grab your interest, then the plot most likely will: three teenagers win a once-in-a-lifetime opportunity to travel to the moon through a NASA lottery. Little do these teenagers know that there is actually an ulterior motive for sending them on this journey, and they are unaware of what lies waiting for them. Pretty intriguing, no? As implausible as the notion of NASA sending three is, it still makes for an enticing story. Unfortunately, however, the execution of the story doesn't quite live up to its potential. We are first introduced to our three winning students: Mia, a Norwegian girls who plans to use this trip to garner publicity for her band, Midori, a Japanese girl who wants a bit of adventure, and Antoine, a French boy simply wants to get away from his ex-girlfriend (really?). This is where the story starts to waver, as one of the biggest problems I had with this novel was the extreme lack of character development and relationships among the characters. Each person was introduced with very specific personality traits, and Harstad was very diligent about not letting stray; I'm not saying I wanted some major dynamic change in the characters, but they were so incredibly one-dimensional that I hardly felt anything for them. None of them were particular likable, either, which I've stated in the past is not necessary for my enjoyment, but this time it really hindered my enjoyment, simply because I just didn't care what happened to them. And I think I felt unfairly bitter at the fact that none of these kids seemed particular interested in the fact that they were visiting the moon; they seemed more interested in their own reasons than the experience itself. Another major issue I had was with the writing. I understand that this particular book was translated into English from its original language, so I'm not sure if that was the problem or if the writing itself still wasn't very smooth. At times, I felt like I was missing some important part of the story or some details were left out. The exposition was also a bit slow going, and by the time we got to the meat of the plot, I was already losing interest. Despite these negative aspects, there was still an underlying creepiness factor that really boosted the entertainment factor within 172 Hours. I really don't want to go into too much detail about this aspect of the book, but it does certainly offset some of the areas in which it lacks. Although this novel has unremarkable characters and lacks depth in some areas, it was still an interesting read, so I will be giving this story two-and-a-half stars.